INTRODUCING “HUNGRY HUNGRY VIKINGS”…A NEW TVHS STUDENT BUSINESS! Hungry Hungry Vikings is off to a great start! The Cross-Categorical High School Class, under the direction of their teacher Megan Colba, has started their own treat-making and delivery business. The students have named the business “Hungry Hungry Vikings” and it allows them to to access vocational and life skills on campus! “I like making the drinks,” Thomas says. 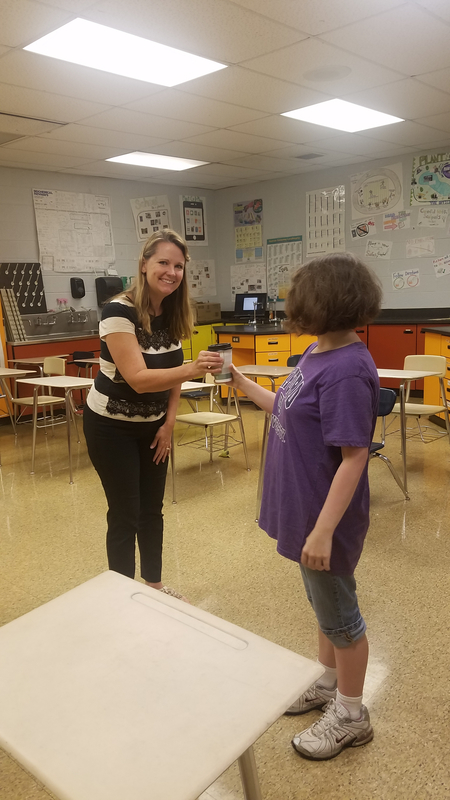 “And I’m excited to try Pancake Bites.” The students are currently working on a few new ideas, including a brownie-inspired “Chocolate Solves All My Problems,” a Pancake, Maple & Bacon Breakfast Bite, and a Buffalo Wing Savory Bite. The Savory Viking Bites are dips served with pretzels or wheat crackers, and the students are having fun coming up with new recipes to try. Testing new recipes and working together to set the menu helps the students work as a team. “I feel good about Hungry Hungry Vikings. I think it’s amazing for us to do it and it’s a way to make us feel happy about ourselves.” Edline has emerged as a leader in working at the business, guiding other students through drink-making, delivery, ringing up orders and making change. “We do a good job at making the drinks. It makes me feel happy,” Aaron says. 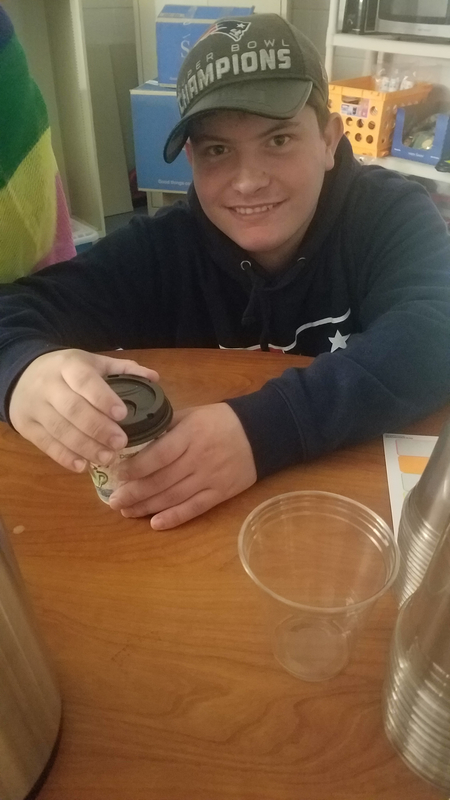 “I love the vanilla cold brew coffee, even though it costs extra.” Each student who helps with the business enjoys a free drink each day, and it allows them to explore the different drinks and practice their skills. “I like to help carry the drinks to teachers, and make the drinks. And, I’m enjoying the coffee,” Zach says. 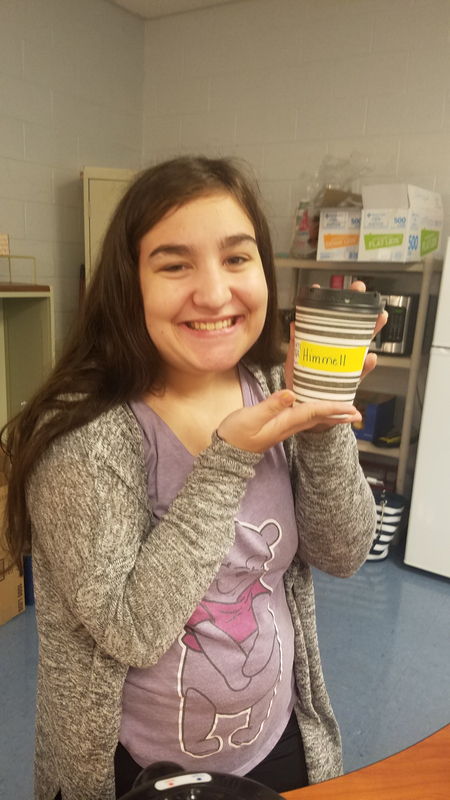 The coffee brew of the day and hot chocolate are the class’ favorites. Hayley has perfected the art of adding just enough marshmallows to the top of each cup. The more drinks the students make, the more comfortable they feel adding special creative touches and making every cup special to order. Whipped cream, caramel or chocolate drizzle, and/or a homemade blend of spices or cocoa powder are sprinkled over many of the drinks, and there’s also one dinosaur marshmallow hiding under the lid of each hot chocolate. 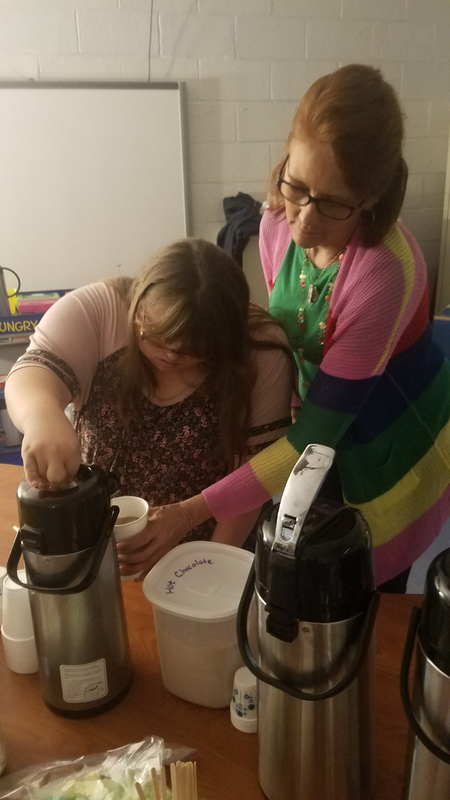 Every student in Home Economics makes the treats and special recipe flavors for the drinks, and they work together to set up the menu that the class works from. The Consumer Business class collaborates to set prices, discuss sales/specials, and make a plan for controlled expansion of the business and customer base. Students enrolled in Consumer Business and Life Skills make and deliver drinks, ring up customers, and give change. “Delivering is my favorite part. I like talking to people,” Brady says. He’s expressed interest in working at a coffee shop in the future. Rae also enjoys seeing and interacting with different people who order from Hungry Hungry Vikings. “It makes me happy to see them and talk to them,” she says. “I love the coffee,“ Lacie says. Her work is more behind-the-scenes due to her schedule. She is in charge of keeping track of the day’s orders and ensuring the money is accounted for. Soon, she’ll take over inventory and ordering as well, as the business expands. The business began serving staff only as the students built up their skills. Now, they’ve begun opening the business up to students, one study hall and art class at a time. Kristin Myers’ second hour study hall was the first guinea pig. Myers says, “I love having them come here. It’s very adult, like my study hall has become a coffee shop. The students really enjoy it and I love seeing all the different aspects come together.” Rachel Angus’ Design Foundations class will be the next class to have the opportunity to order from Hungry Hungry Vikings. The students will gain firsthand experience of the brand that they’ll be competing to design the logo for. Mark McBride’s sixth hour class is the next study hall on the list.